At long last, the weather is improving. Goethe's last words were allegedly "Mehr licht..." or "more light..."
The Nordic tribes can agree with THAT half the year. Now spring has sprung it seems. Here's me and the kids outside the Copenhagen Zoo last weekend. Opted for the Velorbis instead of the Bullitt and put Lulu-Sophia on the bulldog seat between my legs. Strapped on a stroller to the back rack in case she got tired walking around the animal kingdom. The Boy Wonder Felix is on his own bike, with his partisan scarf and hat. Eight years old and already opinionated about clothes and style. The Zoo is close to the city so we just treat it as a park, really. Riding up to hang out for an hour or two, looking at animals. Brilliant to feel springtime in the air. That's better to a child who know how to ride a cycle. Your son is a stylin' little gentleman, very handsome family! So cute. I can't get over how cool your son is. He's like Rock the Casbah! How fabulous is this?! And I have to be another one to say - your boy has some serious style! Delightful! Felix is charming and Lulu is a doll. We have a Lola-Sophia in the extended family - both names are loaded with personality, I have to say. thanks for the lovely comments. regarding helmets: Visit here, soon. I work with kids who are brain injured. Daily I work with the result of kids who's heads have collided with something hard. It's heartbreaking. Funnily enough, I don't see so many bike-related ABIs anymore. I wonder if it relates to helmets on kids being the LAW in my country. They suggestion that helmets don't prevent head injury reminds me of when people also tried to suggest smoking doesn't cause cancer. Or tanning beds dont cause melanoma. Google the WHOs recent stance on that. Hmm or perhaps seat belts don't save lives either. Take the risk as an adult, that's your choice. Risk your kids future because of ??? Fashion? I can't think of a reason NOT to put a helmet on a kid. This is mind boggling. Perhaps it's a cultural thing. Oi! Normally these helmet discussions take place over at my Copenhagenize.com blog where there is a long series of articles on the subject. 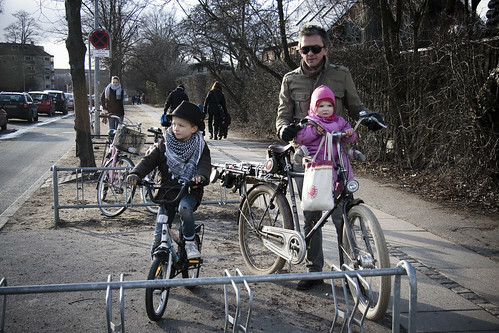 But the short answer is: I don't lie to my children by telling them that cycling is dangerous. I've spent 18 months researching helmets. I've spoken with the world's leading experts, people who design helmets and who test them. My conclusion is the same as advocacy groups around Europe like the European Cyclists Federation, the French, the British, the Dutch and so on. You say you notice fewer bicycle-related ABIs where you live. There is a simple and well-documented reason for that. In every region in the world that has suffered from destructive helmet promotion and especially legislation, the number of cyclists falls drastically. Up to 40% in many areas, as you can see on this list. In societies that are buckling under the weight of obesity and all the lifestyle illnesses that accompany sedentary, modern lifestyles, it is quite insane to scare people off of bicycles. the health benefits of daily cycling are 20 times greater than the little risk involved. You have have the wool pulled over your eyes. Helmets have been called the greatest scam in the histoy of safety equipment. A helmet is designed to protect the head from non-life threatening injuries is solo accidents under 20 km/h. They are only tested for impact on the crown of the head. They don't test them for impact on the sides or the back of the head, where most impacts occur. Regarding brain injury, most instances are caused by rotational injury, not lateral. And far too many studies show that you have a higher risk of brain injury with a helmet ON. Personally, I wouldn't run that risk. You suggest that it may be a cultural difference and you're right. In Europe we focus on getting more people to cycle. But it's also a question of The Culture of Fear as described by the British sociologist Frank Furedi. His book by the same name charts society's slide towards fear, even though we've never lived safer or more comfortable. Strangely, people who promote helmets don't subscribe to logic. Pedestrians and car occupants have a higher risk of serious head injury and yet there is little talk of promoting motoring helmets or pedestrian helmets. And yes, motoring helmets have been invented already. And like I suggested in the earlier comment, be sure to look at The Bicycle Helmet Research Foundation's website.